As devices become smaller and displays become larger, the need for slimmer, high quality screens has increased dramatically. Young Fast’s “Touch Lens” series is a unique touch panel sensor solution that features a slim, frameless form factor, a flat surface, a and decorative film. A major breakthrough of these panels is the frameless display that eliminates the fixture frame around the perimeter of each panel. The “Touch Lens” touch panels also feature improved durability and robustness, providing extra protection and making them well suited for dynamic applications in any environment. 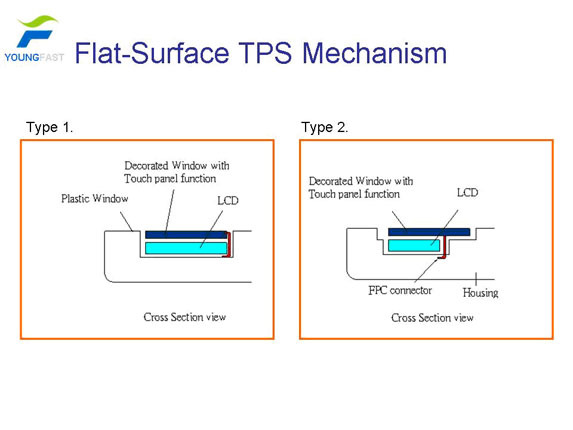 The flat surface, frameless touch panels use either PC substrates or tempered glass substrates. A tempered ITO glass-based solution is also provided to further improve cost effectiveness. The following diagram shows the structure of the Touch Lens TPS solution. 3H- pressure 500gf , 45deg. Suitable for next-generation smart phones and high-end mobile devices.